Ambient scent marketing for movie and live theater spaces is a fragile endeavor that’s best left to air care experts. Briefly, in order to be effective, you must first remove malodors from the air with vaporous neutralizers, and then the evenly diffused fragrance must have an intense, palpable effect on an audience while at the same time, remain invisible. Directors and theater owners approach scent as a means to make an audience feel something, which is no easy task, but if it works well, it is almost as if another supporting character has been added to the cast, adding an extra intangible dimension to the overall performance. According to a recent interview with theater scent designer, David Bernstein: “I split up scent design into two categories. One is an ambient smell or scent, which is scenting the theatre or the performance space as the audience is walking in. Using ambient scent in theater is creating a segment of the set that is invisible. Set and lighting designers must be a part of using this medium as a space with its own boundaries and decide what kind of space (and what kind of emotions) they are looking to recreate within the framework of the theatrical production. According once again to Bernstein, this means functioning like an extra actor because the scent becomes a direct mode of communication with the audience. What scent can tap into concerns what’s going on inside the characters in a live performance. The idea is to transmit their feelings, which are usually negative in nature and fall into the categories of anger or anxiety. Scent marketing has the power to bring the dramatic cosmos to the audience because it unifies the four-walled space of the theater and becomes integral to the viewing experience. The entire stage is a part of the story no matter what the subject, and when it smells different from the audience, there is a velocity in which that scent connects to the limbic system which is the part of the brain that is linked with emotions and memory formation. Fragrance alters perception in a way that other theatrical accouterments, such as lighting, sets or sound cannot do. This being said, the element of sensitivities can sometimes backfire due to an inability to predict audience reactions. Scent comes out of nowhere and lingers on a stage to transmit one meaning only. Success or failure depends on how well it does that one thing. Bernstein stresses that this factor, especially when open to interpretation as a part of stage art, offers the theatrical scent designer a niche of artistic freedom. In the ancient world, the grandeur of imperial Rome exhibited in many public spectacles hosted in the famous Coliseum were often scented. Rosewater flowed from enormous fountains, and on hot days, a large audience often enjoyed sprinklings (sparisones) of a mist scented with balsam or saffron. Sweet smelling smoke was often the way that the ancient world spoke to the gods and the oldest perfumery in the world, dating back more than 4,000 years, was discovered on the island of Cyprus in 2007. The Greek theaters that staged dramas and comedy were mystical settings for scents made from local flowers and herbs, such as marjoram, parsley, irises, violets, and lilies; and spices like cumin and sage. The use of smell in modern cinema dates back to the infant days of the industry. In 1916, D.W. Griffith’s The Birth of a Nation became the first moving picture. In that same year, Roxy Rothafel, the owner of the Family Theater in Forest City, Pennsylvania, wanted to render a touch of elegance to the screening of a coverage about the Tournament of Roses Parade in Pasadena, California, where dozens of floats full of fragrant blooms flood the huge parade around the city. Wads of cotton soaked in rose oil were placed in front of huge fans that hung above the crowd, spreading the fragrance everywhere about. In 1929, several movie theaters in New York and Boston, influenced by the Rose Bowl success, attempted to introduce one scent from the ceiling and through the vents of the movie house during the showing of two movies; namely, The Broadway Melodie and Lilac Time. Its effect had no relevance and just served as an air freshener as the audience became accustomed to the scent. Some two decades later, Hans Laube further advanced the use of scent when he launched Scent-O-Vision at the 1939 World’s Fair, which was held in New York. Scent was released by a control board that was managed by the projectionist via pipes that were connected to the seats in the audience. Before an adequate review of this technology could be expressed, the police seized all rights to it, arguing that a similar scent system was already in place somewhere else in the United States. In 1943, a Detroit cinema made a significant attempt to synchronize odors with occurring scenes by using compressed air, which pumped different fragrances into the air-conditioning ducts. During the filming of The Sea Hawk, starring Errol Flynn, creators tried to simulate the smells onboard a boat with aromas of tar and salty ocean breezes. In Boom Town, which starred Clark Gable and Spencer Tracy, each of the characters possessed their own personal aromas of coffee and tobacco. This early attempt at scent marketing sent fragrance through the air-conditioning system and was first tried in New York’s De Mille Theater (formerly The Mayfair) in the film, Behind The Great Wall. The film received poor reviews from The New York Times and a few weeks later, Michael Todd Jr. used a similar technology known as Smell -O-Vision for the film, A Scent of Mystery. This system pumped smell out of a series of vents beneath the seats. It didn’t do very well either and soon became forgettable history. It would take a few more decades of research and commitment for the true power of ambient scenting to reveal itself to the commercial world, thanks primarily to our early technicians and inventors. Other gimmicky innovations for theaters and movie houses such as Odorama, which was inspired by Smell-O-Vision for the movie, Polyester, were mere flashes in the pan, as the powers-that-be behind theatrical productions soon realized that most audiences prefer a more straightforward viewing experience. 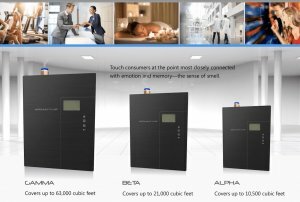 Ambient scenting, scent marketing, odor-control additives and air freshening solutions have evolved over the course of the last sixty or seventy years as have our skills and expertise in ambient air-care. Fresh air cannot occur without highly effective odor control, and our array of scent delivery systems designed for large settings, such as The Aroma Beam and The Aroma Styler, coupled our wide selection of odor-control products laced with Metazene for use in commercial restrooms and trash areas are the best found anywhere in the world today. The Aroma Beam is a superior, dry vapor scenting system suitable for any large commercial space. It diffuses and effectively freshens interior spaces of up to 50,000 cubic feet. Its non-nebulizing (without wet vapor) method of scent diffusion has the power to evoke positive responses in audiences in large theaters and movie houses via the sense of smell. The 30-day refill systems come in two varieties: the Aroma Beam Cartridge and The Aroma Beam Squair. The former contains 30 days worth of pure fragrance specially formulated to create a desired response. Dozens of choices are available as well as the option to create a custom scent. The latter offers the availability to mix and match a particular customized scent from many available aromas. Our refills also offer 30 days of fully adjustable performance. Also known as the Scent Styler, this HVAC atomizing diffuser system comes in three application sizes and is both potent and easy for theaters to use. Cutting edge and innovative technology creates a vapor that is invisible and floats evenly across any large open space, such as a stage. This system is ideal for ambient scenting. 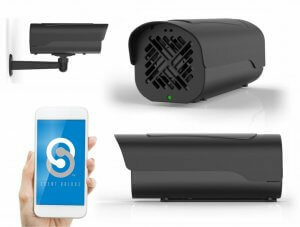 It controls malodors and greatly improves indoor air quality for movie houses and live theaters. We offer a vast array of professional air freshener systems that will relieve the anxiety of theater and movie house managers about the daunting task of maintaining spotless bathrooms in both movie houses and theaters. Some of these include: the Aroma One; the battery-operated Millenium Fan Air Freshener Dispenser, which can accommodate all types of Air-Scent refills; The Odyssey Dispenser, which is ideal for eliminating foul odors in commercial restrooms and is well known for its three-way ventilation for maximum air flow; the automatic, non-battery-operated Odyssey Drip Dispenser, which cleans and deodorizes washroom fixtures; and the Aeon Advanced Air Freshener that can instantly convert from passive operation to battery-driven fan power. Every business under the sun generates trash and garbage that must be regularly eliminated in order to maintain a safe and healthy workplace, and stubborn trash room odors must be addressed, as they can ruin the first impression (there isn’t likely to be a second) of any theater or movie house. The main reason some odor-control programs work better than others is not very mysterious. It is because some are better than others. With well over seventy years of on site-experience, laboratory refinements and product development, our odor-control products are heads above the rest and far exceed industry standards. The presence of bacteria that are not properly removed either because of infrequent or inferior cleaning procedures (or both) is the culprit responsible for the crime of malodors within a theatrical setting. Freshening the air is a temporary fix, no matter how carefully it is applied. This procedure can be compared to placing a Band-Aid over a wound rather than treating it. The smelly truth is that masking bad odors only makes them worse because they blend with the foul smells that are already there. Theater and movie house managers must get pro-active and take the time to research and opt for more efficient methods. This always leads to the use of special odor-eliminators, such as Metazene, our private, patented pride and joy. Malodors speak a negative language all their own and only one neutralizer addresses them in a way that silences them forever. This colorless vaporous neutralizer contains molecules that attach themselves to the heavier odor-causing bacteria, causing them to sink and evaporate. Other odor neutralizers depend upon surface contact with enzymes and anti-bacterial agents to produce a microbial action that will eliminate foul odors. While this does occur on a limited level, microbial agents are completely ineffectual when it comes to residual or vaporous odors. With Metazene, it is a matter of weight and chemical reaction; chemicals bond with foul odor molecules, which are lighter in weight, and alter their electron configurations. This supremely effective, dual action, vapor-phase odor-neutralizing additive guarantees a pleasant smelling room. Ultimately, to eliminate the gram-active bacteria causing the odors in a trash room, a three-pronged approach must be initiated involving cleaning, sanitizing and disinfecting. Outside professionals and air care specialists must do more than just cover up the malodor; they must determine its root cause and then treat it accordingly, no matter what size of the room or the degree of stench in the malodor. Today, products containing Metazene are the answer for fresh clean air in all commercial spaces, including movie houses and live theaters. Metazene is the magic bullet for the war that rages endlessly between theater and movie house owners and recurrent malodors in high-traffic areas, particularly trash rooms and public restrooms. The deployment of scent in movie theaters and movie houses has survived more than a century of trial and error, innovations and flops. Cutting edge technologies and the immersive viewing audience experience have often been at odds and sometimes coincided down through the years, but today the sweet, triumphant smell of scent success has arrived, although it is always a work in progress, as all art forms must be. If you’re an air care supplier, scent marketing company or you own or operate any type of theater, send us an inquiry or call our team today to improve your audience experience with the power of our highly effective odor control and ambient scent. Lights, camera, action and, smell!